Specifications and installation plans can be agreed, to suit individual customer requirements. 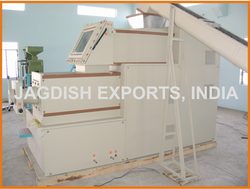 Toilet Bath & Beauty Soap Manufacturing Machine that are Manufactured in India are known for its long life under any circumstances running at 24 hours a day. The Britannia Mixer will effectively combine all liquid powder or solid constituents of a soap formula with speed and effectiveness. We offer a range of blade designs for natural or synthetic, toilet or laundry soaps as either noodle, flake or ribbon. 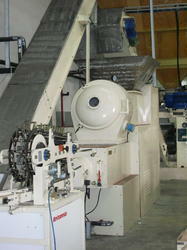 The machine can be either bottom discharge or tilting type. Speed:- Up to 60 packs per minute depending on the matrix and the size of the soap. - forges steel pipe fitting. • Can be connected on line with wrapping machine. Saves multiple movements of cartons. • Uniform banding of Soaps. • Can be used for assorted pack offline. • Registered/Continuous printed design can be used. • Total Mechanical design, No Pneumatics, means a lot of saving. Oils is a mixture of various types of triglycerides. When oil reacts with alkali solution, sodium salt of fatty acids and glycerin are obtained. A blend of hard oil and soft oil is used for making soap. Soap can be obtained by following process.